Inspiration Required Lately? - Brilliant Breakthroughs, Inc.
Home › Business Strategies › Inspiration Required Lately? Do you know how to make a big splash? Are you sitting on an idea that is a “game changer”? Inspiration is expected to be provided, by Business Leaders, to others at all times. Is this a practical expectation? No! From time to time a Business Leader needs inspiration too! It’s impossible to offer what you don’t have. The question then becomes, “Where did all your inspiration go?” We all know that far too often Business Leaders are consistently functioning at a full-powered warp speed which eventually just fizzles out. Don’t feel bad – I assure you this is quite normal and common! Is this you? 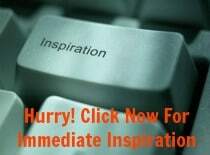 Do you need your inspiration spark re-ignited? Inspiration’s natural tendency is not to always be “on”. It’s similar to the tide, with its own ebb and flow. When this happens, the first thing to do is own it and change what you are currently doing for a little while until you have your “game on” again. I assure you that all leaders go through this! The question is what are you going to do about your lack of inspiration? I always find a story of something uplifting to help me begin shifting my mindset. When I do this it helps me identify what I must do to get out of my “funk”. For years my clients have told me this approach is helpful to them as well! The following link shares an inspiring true story of a great need and a man who was inspired to make a a difference – a BIG difference! If you are stuck or need a little inspiration… after all, who doesn’t with half a year of winter and extreme weather? Read on! If you are fine and want to save it for another day, please bookmark this and come back to it often.